Sir Ian McGeechan has pinpointed England's opening Six Nations clash with Wales as pivotal in this year's battle for the northern hemisphere crown. The British & Irish Lions legend, knighted in the New Year Honours List for his services to rugby union, will return to the supporters' ranks for this year's Championship having analysed the Home Unions' fortunes a little more closely 12 months ago in preparation for last summer's tour of South Africa. McGeechan is currently enjoying an extended break from the game but he admitted to ESPNscrum that it will be hard not to cast a critical eye over proceedings. He has already singled out the mouth-watering showdown between England and Wales at Twickenham on February 6 as a key fixture. 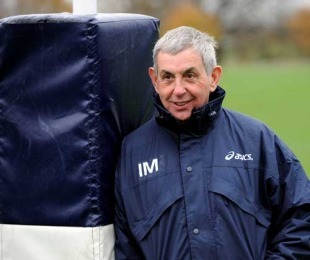 "The England and Wales clash first up is a massive game," said McGeechan. "England may be at home but Wales will know that whichever team wins that game will be in a very good position going into the rest of the tournament. If Wales won that they could then look forward to three home games. I think every country feels that if you can sneak an away win early it can be a huge boost and that will certainly be the case should they win at Twickenham." But McGeechan feels that Ireland will perhaps be the team to beat as they go in search of back-to-back Six Nations Grand Slams. "The team in very good shape is Ireland," he said. "They are unbeaten for the last 12 months and their sides have looked strong in Europe. There is good mix of youth and experience and they have a coach [Declan Kidney] who sets the right tone for them. I think it is always difficult to call in a tournament where you are not playing home and way so three home games, as Ireland will have, will make a difference." McGeechan has enjoyed following the domestic season at "arm's length" and believes the Heineken Cup is a valuable pointer as to the likely destiny of this year's Six Nations, but warned that England could return to form. "Ireland and France are in a strong position and the Irish and the French players will be very confident coming out of Europe," said McGeechan, highlighting the fact that six of the eight quarter-finalists in this season's Heineken Cup come from the two countries. "But Martin Johnson will be happier now he has some of his front-line players fit again. I think it was a big challenge for them having made the progress last year, and they certainly did finish last year's Six Nations strongly, not to be able to develop that in the autumn because of so many injuries. He's starting again to a certain extent, but he'll feel happier he has got those players back and fit again." McGeechan was not surprised to see Johnson stick by his man and re-appoint Steve Borthwick as his captain for the Six Nations despite criticism of his leadership from certain quarters. "I think the relationship between coach and captain is very important and he [Johnson] sees that importance in terms of making the team perform and he is right to think that," said McGeechan, who chose Johnson as his skipper for the 1997 Lions tour to South Africa but did not deem Borthwick worthy of a place on the 2009 tour. "Obviously has got a very good working relationship with him and they think the same things and are trying to do the same things and that is what you need." As for the Six Nations as a whole, McGeechan is looking forward to watching the Championship unfold and admitted it will be hard to change the habit of a lifetime. "It was interesting watching it last year because we were looking for players coming through, even if their team was not playing well," he said. "In particular we were looking at individual performances and I still tend to do that now. Sadly, I never manage to just watch a game, you see things evolving and find yourself looking at certain players and certain things."